What really is a tanning accelerator? Tanning accelerators are lotions that increase the amount of melanin your skin naturally produces when exposed to ultraviolet (UV) rays. 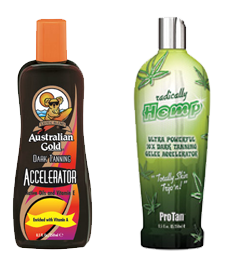 When used prior to UV exposure it helps produce more melanin helping you tan much quicker!! This is a very good lotion to start the tanning process! !